Around 185 m2 of Heliatek’s organic photovoltaic films have been installed on the façade of a warehouse of German company Duisburger Hafen. The development is part of an agreement called Drehkreuz Energiewende, made between Duisburger Hafen and energy company innogy in 2016. HeliaSol is a lightweight, thin and flexible solar film that is produced in a roll-to-roll process in Germany. Equipped with a self-adhesive backing, the film can be applied directly to a variety of surfaces without further assembly. 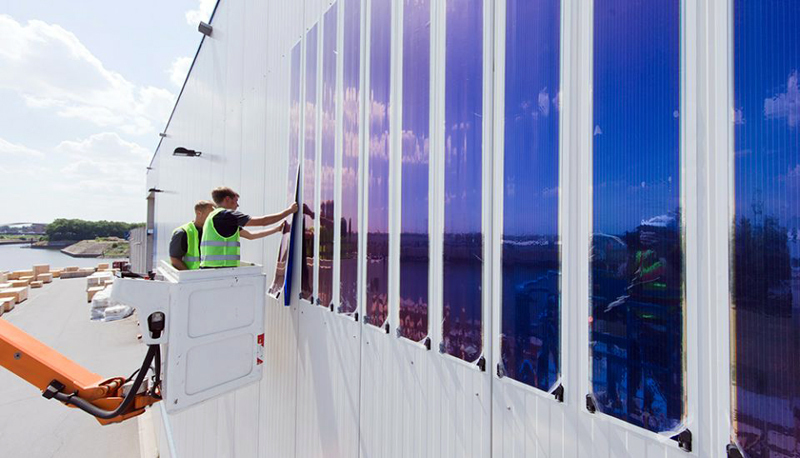 With the project in Duisburg, the solar films were glued directly onto the metal facade of the warehouse. Ventilation or cooling is not necessary as the films do not lose power or efficiency at high temperatures, unlike crystalline solar technology. In the Duisberg installation, the solar films generate about as much energy as a 5-person household would consume annually. Due to the efficient use of materials and manufacturing process, the solar films produce 80 times more energy over their lifecycle than is needed to produce them. When compared to the CO2 emissions of various other types of energy production, Heliatek says its solar films provide the lowest CO2 footprint, with 20g CO2 per kWh. Duisburger Hafen is the operator of the world’s largest inland port and intends to position itself as a major hub for the energy transition. The construction of the solar facade is one of four areas of cooperation and a large number of measures implemented between innogy and Duisport for a successful sustainability strategy.